The U.S. General Accounting Office is seeking to identify federal policies that promote sprawl. The study, scheduled for completion in 1999, was requested by Senators James Jeffords (VT) and Carl Levin (MI). It will look at a wide range of federal policies and program areas, including housing, transportation, agriculture, taxation, the siting of federal facilities, and more. If you have suggestions for federal programs or policies which should be evaluated, contact Susan Campbell, Assistant Director, GAO, at campbells.rced@gao.gov or phone 202-512-6790. For a summary of the study objectives, visit http://www.webcom.com/pcj/sprawl/gao1.html. Shipments of photovoltaic modules and cells by U.S. manufacturers reached a record level in 1997, up 31 percent from year-earlier figures. The growth in shipments was due largely to a strong export market, which accounted for 73 percent of the shipments. This marked the twelfth consecutive annual increase, according to official data on the solar industry released by the Energy Information Administration (EIA). The EIA report covers both of the major forms of solar energy, photovoltaic devices which directly convert the sun's energy to electricity, and solar thermal collectors which use the sun's energy to heat a working fluid (often water) for heating or generating electricity. The average annual rate of increase in photovoltaic shipments over the past 12 years has been 19 percent. The value of shipments of photovoltaic modules and cells grew from $131 million in 1996 to $175 million in 1997. The price per unit increased 2 percent. In 1997, there was a 71-percent increase in the shipments of photovoltaics for connection to the electric power system. Photovoltaics historically have been shipped and used at remote areas to provide electricity. Although shipments of solar thermal collectors increased 7 percent between 1996 and 1997, the value of these shipments remained nearly the same at about $29 million, because of a 9-percent drop in the average price per unit. More than 90 percent of shipments of solar thermal collectors were to the residential sector for use as pool heaters. Data tables covering most of the 1997 photovoltaic and solar thermal information are on EIA's website at ftp://ftp.eia.doe.gov/pub/solar.renewables/solar.txt. Printed copies of the Renewable Energy Annual are available from the U.S. Government Printing Office at 202-512-1800 or through EIA's National Energy Information Center at 202-586-8800. 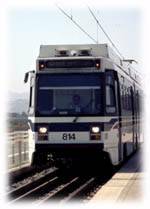 Use of the nation's public transit systems continues its growth trend. Ridership for the first six months of 1998 increased 4.1 percent over the first half of 1997, according to the American Public Transit Association. Transit use has been climbing steadily since 1995. "The strong economy, coupled with increased federal funding over the past six years, prove that if we invest in public transportation, more and more Americans will get on board," said William W. Millar, President of the American Public Transit Association, who released thelatest figures during the association's annual meeting here. "It all adds up: increased investment means a better quality of life for all Americans." Transit ridership increases this quarter were led by bus systems serving populations less than 50,000 -- up 6.5 percent, light rail -- up 5.8%, and bus systems serving areas with over 2 million population -- up 5.1%. Commuter rail ridership grew by 4.6 percent, and heavy rail and demand response service showed increases of over 3 percent. Millions of waste tires are stockpiled in California, and a grant from the California Integrated Waste Management Board made it possible to use 4,100 of them mixed with asphalt to pave almost two miles of a popular trail and bikeway along the American River in Sacramento. "This project demonstrates the value of recycling in a way that many people can easily relate to," said Waste Board Member Dan Eaton. "It’s not a four-lane superhighway, but recreational bikers, runners, bird watchers, and outdoor hikers all will benefit from this recycled product technology." Rubberized asphalt concrete (RAC) offers superior longevity and traction, as well as a more quiet surface and less fracturing than conventional paving. Because of its porous nature, traction in the rain on RAC pavement tends to remain high. 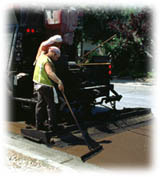 RAC has been used in public roadways throughout California and other parts of the nation. The product is a mix of crumb rubber –– small, pelletized pieces of ground-up tire rubber –– mixed with asphalt binder and rock aggregate. California generates an estimated 30 million old tires every year, adding to existing stockpiles of up to 15 million tires already stored –– legally and illegally –– around the state. Under a best-case scenario, in which all suitable asphalt paving projects in California used only RAC, the Waste Board estimates as many as 6 to 10 million waste tires could be consumed each year. Maryland motorists are dodging more potholes these days, but Maryland transportation agencies have spent most of the money available for maintenance to expand highways rather than fixing them. According to a new report entitled Potholes and Politics 1998, Maryland spends an annual average of about $20,000 per urban highway mile in need of repair, compared to a national average of more than $90,000. This underinvestment in roadway maintenance costs drivers $166 million annually for added car repairs, or about $700 per car. The report was released by the Surface Transportation Policy Project, a Washington, DC based non-profit group, inpartnership with the Chesapeake Bay Foundation, The Environmental Defense Fund, the Citizens Planning and Housing Association, the Baltimore Urban League, and 1000 Friends of Maryland. Vice President Al Gore has announced three federal initiatives to help communities achieve smart, sustainable development. Location Efficient Mortgages. The Vice President announced that Fannie Mae, in partnership with several non-profit groups, is launching a $100 million pilot project that will provide lower-cost mortgages and 30-year transit passes to families who buy homes near mass transit. These mortgages will give families more choices by enabling them to live in more desirable neighborhoods, while encouraging smarter growth. Computer Mapping Software. The Administration will offer grants that will enable communities to get and display federal information on easy-to-understand computerized maps. The maps will show the scope of the community -- from parks to farmland and buildings -- and will make it easier to adopt sensible land use policies. Protecting Farmland. Gore also announced the final installment of a $35 million Farmland Protection Program established in the 1996 Farm Bill. This will provide funds to 19 states and protect more than 53,000 acres of farmland. An international water conservation conference in Monterey from January 31 through February 3 will focus on water demand management. Entitled Making Cents in the Next Century, the conference will spotlight successful water conservation programs through exhibits and seminars. Paul Hawken, businessman, environmentalist, and author, will be the keynote speaker at the opening general session. Hawken is chairman of The Natural Step, a non-profit educational foundation promoting environmental sustainability as an integral part of overall business strategy. For further information, call the American Water Works Association at 800-926-7337 or visit their website at http://www.awwa.org. Water quality professionals dealing with biosolids and water treatment residuals may want to attend the WEF/AWWA Joint Residuals and Biosolids Management Conference: Strategic Networking for the 21st Century coming to Charlotte, N.C., January 27 through 30, 1999. The conference will feature sessions on facilities design criteria, dewatering, nutrient management, public acceptance, phosphorus control, and more. Three facility tours will take attendees to a residuals management facility, a composting facility, and a unique dryer that utilizes a wood burner with a natural gas backup to produce the heat energy required to dry biosolids. The event will begin with a workshop, "Research Symposium on the CFR Part 503 Risk Assessment: Past, Present, and Future." Moderated by Terry Logan, co-chair of the W170 CFR 503 Peer Review Committee and a professor at Ohio State University, the symposium will examine the technical basis for the risk assessment used to develop federal guidelines for biosolids use, as well as the future direction regulations might take. Keynote speaker David Pearce Snyder, an editor for The Futurist magazine, will deliver "Water in an Info-Mated World: Micro-Managing Our Most Vital Resource," an address on the social and scientific trends affecting the future of the water quality industry. The final session, "Control of Pathogens and Vector Attraction in Biosolids," will also be noteworthy. Headed up by James Smith of the U.S. Environmental Protection Agency's Research Laboratory in Cincinnati, this session will feature the foremost authorities in the United States on pathogens, pathogen reduction, and vector attraction reduction. For details, call 800-666-0206 or e-mail confinfo@wef.org. For online information, visit http://www.wef.org/docs/99bio.html. Energy $mart Schools is a new U.S. Department of Energy initiative that can save billions of dollars in school energy costs and redirect those savings toward children's education. According to a 1995 General Accounting Office report, 28,000 schools have less than adequate heating, ventilation and air conditioning systems and 21,000 have faulty roofs. In addition, many schools now under construction are not using cost-effective energy efficient and renewable energy technologies and best design practices. According to Energy Department figures, the savings from using smart energy practices in new and existing schools could return up to $1.5 billion dollars annually to individual education systems by 2010. The Energy $mart Schools project is a partnership among government and educational institutions, public utilities, energy service companies, builders, equipment suppliers, national education and energy associations, and community groups. The project's four goals are: to reduce energy consumption and expand the use of clean energy technologies; to develop incentives for the savings to be reinvested in education needs; to improve the indoor environment in schools; and to increase awareness of energy-related issues in schools. To learn more, visit http://www.eren.doe.gov/buildings/energysmart. The Santa Monica City Council has unanimously directed city staff to purchase green power for City Hall and other city facilities. This precedent-setting action was promoted by Global Green USA, the American affiliate of Green Cross International. "By switching city facilities to green power, Santa Monica has given confidence to the growing number of local residents and businesses interested in joining the city in choosing renewable energy," according to Matt Peterson, Executive Director of Global Green USA. "There are ample products and companies that can service the city's needs by providing clean, environmentally friendly power." Led by local business people, Global Green USA is spearheading a Southern California effort called the "Green Power Campaign" to get business and residences to choose green power, a choice made possible by utility deregulation. The media and grassroots campaign is helping consumers realize that their new utility choices -- made possible by deregulation -- can help protect the environment, stem climate change, and create a renewable energy industry. To learn more about using green power, visit http://www.eren.doe.gov/greenpower/index.html. The Pew Partnership has launched "Wanted: Solutions for America," a new initiative designed to empower cities with creative and effective problem-solving tools. Pew is seeking to identify 50 communities that have developed a solution to an important issue, such as housing, jobs, at-risk youth, or the environment, and is willing to share that solution with other cities across the nation. For more information, visit http://www.pew-partnership.org/wanted/index.html.